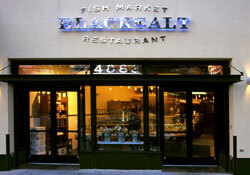 BlackSalt Fish Market & Restaurant, Washington’s premier seafood restaurant, is wholly committed to the sustainability of fish and shellfish stocks worldwide. We constantly strive to source our products from companies and individuals who are like minded. Through conscientious consumption and education we can all work to protect the invaluable resources that are provided to us by the sea. 04/05/2012 Easter Dining & Events in Washington, D.C.